Under the law, threatening violence, using obscene language and calling persistently with the intent to irritate/annoy amounts to harassment. Also, calling home at odd hours or at work place if there has been a notification to not do so or even calling up relatives or friends without your permission can all amount to harassment. What Can be Done to End to Harassment? Attempt to engage the creditor before anything else, unless you have a strong feeling that the person may not be pleasant. Explain the reasons for your default, and try to reason with them and ask for payment extensions or payment options, or present any payment plans you believe will be feasible. As much as one would hope reason and logic can win the battle, the fact is that more often that not, it will not work this way. 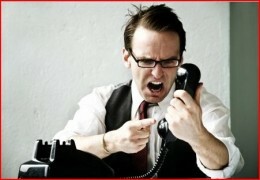 Debt collectors will almost certainly live up to the stereotype of being unreasonable, difficult people. The next option you, as a debtor, have is to file for bankruptcy. Bankruptcy will ensure that all debt collection actions (including phone calls), ethical or otherwise, come to an immediate end. As soon as you file for bankruptcy all creditors and bill collectors must immediately end their collection efforts. Once you’ve filed for bankruptcy, both the Bankruptcy Court and the attorney will notify all creditors of your bankruptcy through the mail. In the meanwhile, since this could take a week or so to reach them, you can also notify them in case you get a call, or a creditor comes ringing your doorbell. Legal Remedies in lieu of Bankruptcy? Act (FDCPA ) prohibits a collection agency from engaging in many kinds of activities. (15 U.S.C. §§ 1692 and following.) If a collection agency violates the law, you have the right to sue the agency. If the creditor that hired the agency was involved in the unlawful conduct, you may also be able to sue the creditor. If the behavior is truly outrageous, the creditor may waive the debt and remove the negative marks from your credit report in exchange for your agreement not to sue. Under the FDCPA , a collection agency cannot legally engage in any of the following activities. 1. Communications with third parties. • at work, if the collector knows that your employer prohibits you from receiving collections calls at work. If you are contacted at work, tell the collector that your boss prohibits such calls. • place telephone calls to you or any other person without identifying him or herself. • threaten to take action that he or she does not intend to take or cannot take. • call you collect or otherwise cause you to incur communications charges.